Ever wonder what histamine is? Know someone that has a histamine intolerance and need some guidance? 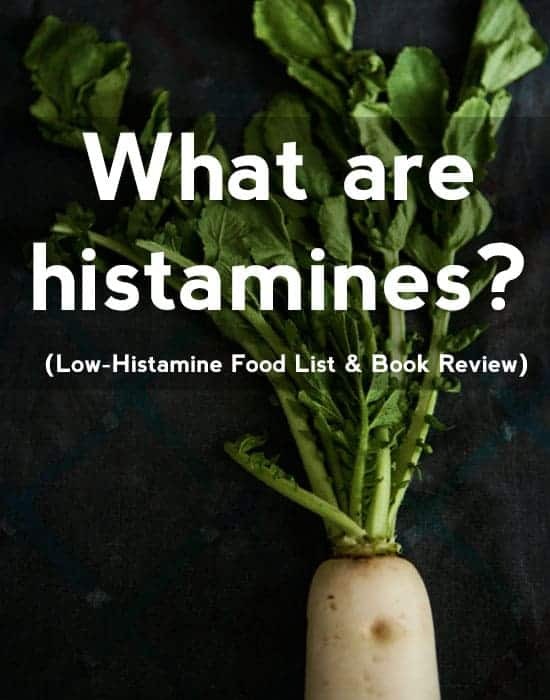 This post explains what histamine is, what foods to avoid, and a vegan histamine book review. Histamine is a neurotransmitter (which communicates messages between your body and your brain) and a component of stomach acid (which is what helps you break down food). Histamine is also the chemical compound that is involved in allergic responses. We release histamine when our immune system tries to neutralize/eliminate anything it perceives as a treat such as things in our environment like pollen, dust, animal dander, toxins or heavy metals. High histamine levels can also be caused by IgE reactions (allergies), leaky gut, small intestinal bacterial overgrowth (SIBO), and an excess of histamine-rich foods. Some people have an intolerance to histamine itself or are prone to higher histamine levels, due to genetic factors that affect the enzymes responsible for breaking down histamine, like the DAO (Diamine Oxidase) enzyme. Certain foods have higher levels of histamine than others. Everyone is different so what may cause a reaction in one person, may not in another. Find out what works best for your body and go from there. This is not a complete list but a place to start if you have issues with histamines. While this may seem like a big list, remember there are so many other foods out there for you. Don’t focus on the foods you should avoid, focus on what you can enjoy. If you do have issues with histamines, try cutting these foods out for a few months and then you can test them individually and see how your body reacts. Working with a nutritionist could be beneficial if you’re unsure where to start. Histamine also accumulates in leftovers, so eating freshly cooked foods is always best for those with histamine issues. Freezing food right away can also be a big help if you have leftover food. Today I also wanted to talk to you about a new cookbook from my friend Randi at Bohemian Vegan Kitchen. Randi has had histamine issues herself and understands what foods to limit and which to enjoy. Randi lives a vegan lifestyle and needed foods to cook for herself and her family. 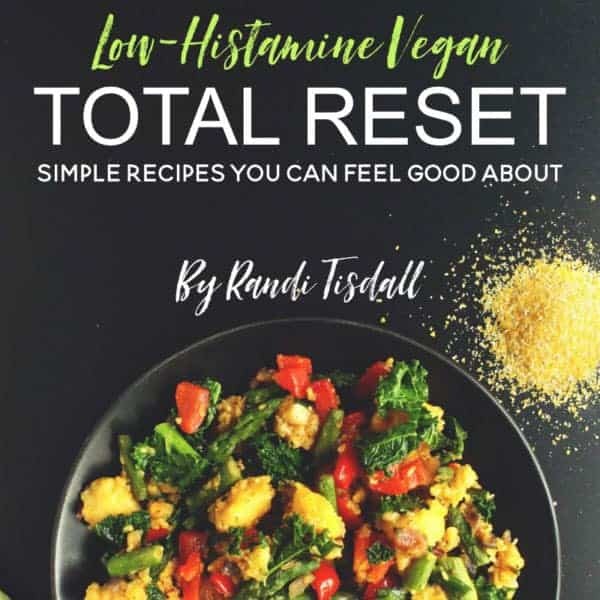 When she was searching for recipes, she couldn’t find many out there so Randi, being the brilliant and resourceful woman she is, decided to make a cookbook to help others in a similar situation and the Low-Histamine Vegan: Total Reset was born! I love how Randi highlights so many delicious foods that those on a low histamine plan CAN eat and doesn’t focus on the restrictions. Just look at all these tasty meals! Recipes included in the book are breakfasts, entrees, snacks, and staples. She also includes a list of web resources for nutrition information. Each recipe has a picture, which is always something I look for in cookbooks. Who’s with me? So if you’re interested in a vegan low-histamine source for tasty food, be sure to check out the Low-Histamine Vegan: Total Reset! You’re awesome! I’m so excited for you and your cookbook! I know everyone will love it. You are a great inspiration! Very interesting and I need to check out this book! Great run down and information, thanks! I’m so glad you enjoyed it. I didn’t really know what it was either before starting my nutrition education so don’t feel bad about that at all! i would love to find a source that can truly meet my food needs. most low-histamine recipes seems to rely on things that i can’t have, like paprika or sweet potatoes. i’m running out of ideas. or, maybe i need to come up with my own cookbook? Hi Ally. I know it can be really hard when you have an intolerance to find foods that you’re able to eat. Paprika can can be a problem but sweet potatoes are usually okay for most people with histamine intolerance. Is that a separate sensitivity/intolerance or are you finding the sweet potato are problem because of histamines as well? I looked over Randi’s book and out of the 24 recipes, only about 3-4 of them contain sweet potatoes so that might be an option for you. I also didn’t see any mention of paprika. 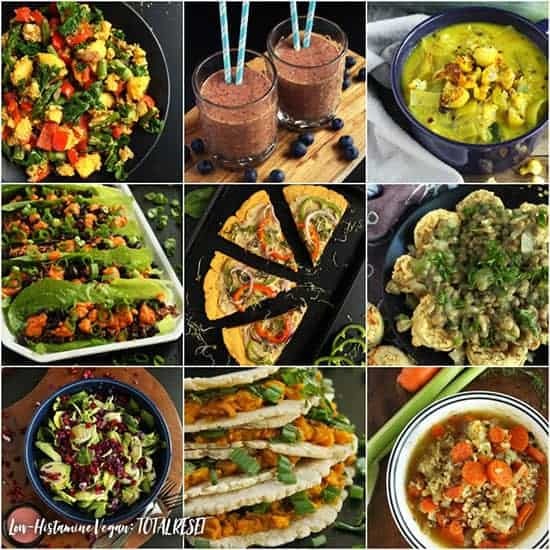 Randi does have a lot of low histamine recipes on her blog which might also help: https://www.bohemianvegankitchen.com/explore-plant-based-recipes/. If you do make your own cookbook I’m sure it would help a lot of people looking for these type of recipes as well.